Something as simple as a T-shirt has a military connection. And this year, it celebrates its 100th birthday. 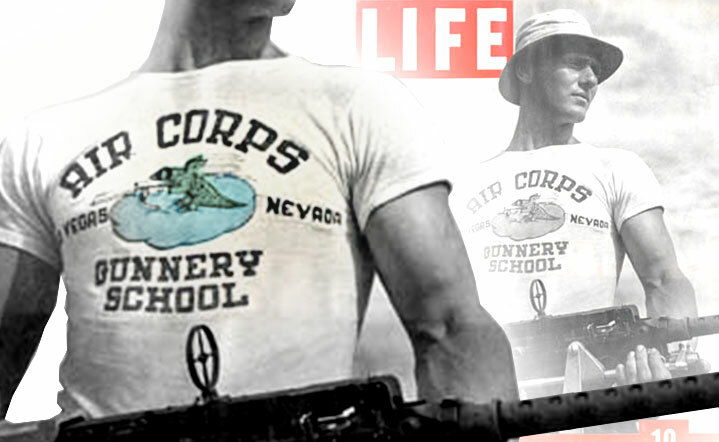 The Air Corps Gunnery School logo is featured on one of the earliest printed T-shirts for the July 13th cover of LIFE magazine in 1942. (Photo courtesy CustomInk). In 1913, the U.S. Navy was the first military branch to issue the T-shirt to be worn under uniforms. By WWII, it became standard issue for both the Navy and the Army. Labeled as “underclothing,” it eventually became acceptable for soldiers to remove their dress shirt while working in hot climates, wearing nothing but their uniform pants and a T-shirt. While the public didn’t love that idea at first, more and more people embraced T-shirts when new designs and colors emerged in the 1950s. And after many generations and iconic images, we still celebrate it today. In these early summer months, CustomInk is hosting military themed T-shirt campaigns designed by military members. May was Air Force’s month, and the company helped raise more than $2,200 for the Yellow Ribbon Fund, with 181 Air Force-themed T-shirts sold. It was designed by Lt. Col. Rosalie Alejo Duarte. The Yellow Ribbon Fund is a not-for-profit charity that aids returning service members who have been injured and are recovering at Walter Reed National Military Medical Center and Fort Belvoir Community Hospital. This month is Army’s T-shirt, with Marine and the Coast Guard following. View more from the history of the T-shirt here, and look into starting your own campaign here.